Like back pain, neck pain is one of the most common conditions that people present with to a chiropractor. We move our neck many hundreds of times each day without even thinking about it – we take for granted that we will always be able to do it! It is only when that awful moment arrives, when we find our neck is ‘cricked’ and the pain that generally follows it makes life unbearable, that we realise that something’s ‘gone wrong’. It doesn’t take much force to disrupt the delicate balance of head-on-neck. Often we find that we have a pain in an arm that is actually caused by a ‘disruption’ in the region of the neck; many times we have not even been aware of when we actually did the damage. There are several areas of the body that can be affected by even a slight twist or injury, or simply from poor posture during a work (or play) activity requiring deep concentration. Neck-originating conditions often appear to contribute to headaches, muscle spasms in the shoulders and upper back and ringing in the ears. The neck and upper back are linked because many of the muscles that are associated with the neck either attach to, or are located in, the upper back. The way we sit, the way we stand, even the way we sleep in bed all add to the possibility of neck pain. Being unaware of the correct posture we should be maintaining on a daily basis eventually adds up to neck and back pain. So, what can we do about it? A simple rule to follow is to keep the neck in a ‘neutral’ position. In addition remember not to hunch or bend forward of the body’s centre of gravity for lengthy periods. If your work entails remaining sedentary for long periods of time, ensure that your back is supported and that your knees are slightly below your hips. 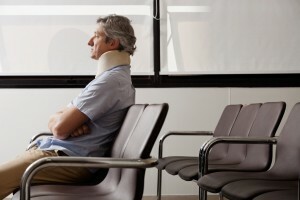 Whiplash is the most common form of neck injury. It may be as the result of a car accident, sporting injury or other sudden event that creates a sharp movement of the head forward, backward or sideways. Such injuries should be examined and treated without delay as they can have very long-lasting effects if ignored. Any such injury needs to be taken very seriously and should be looked at by a chiropractor so that it may be accurately diagnosed and treated. One complication of any delay before getting the injury checked can result in permanent damage to the affected area. A Subluxation is a mis-alignment in the joints and vertebrae of the spine. Because the head is a heavy part of the human body it takes some fairly strong muscles to keep it upright. Mis-alignments in the neck and upper back area are extremely common due to the high degree of stress associated with holding up your head. Chiropractors correct subluxation by using a specific force on the subluxated vertebra – this is known as an adjustment. Stress has many causes, one of which is an instinctive reaction human beings have to danger – physical danger in particular. This reaction is called ‘muscle-guarding’ and is the body’s way of protecting our major organs against injury. Under emotional pressure (stress) we unconsciously tense our muscles – it is largely our back muscles that undergo this tensioning effect. As a consequence the most affected regions are the neck, the lower and upper back. To alleviate stress, exercise on a regular basis; you can easily achieve this by walking for half an hour each day or, as a minimum, even just three days each week. If you know how to breathe correctly you can also ease stress generally by deep breathing – a few deep breaths, gently in through the nose, smoothly out through the mouth. Practice this regularly and you will quickly discover that this method alone can reduce the stresses you feel and those of which you are not even consciously aware. Chiropractors work on the principle of reducing interference so the nervous system and body can work better. Providing that any symptom or condition is occurring as a result of nerve interference from vertebral subluxation, there is a very good chance that it will improve with chiropractic care. Recently, the Bone and Joint Decade 2000-2010 Task Force on Neck Pain and Its Associated Disorders was established to review scientific research and create reports which would discuss the management of neck pain. This task force has reported that neck pain is a widespread condition which tends to recur. They indicate that there are many causes of neck pain, and that various factors may contribute to the onset of neck pain. Interestingly, the treatments recommended by the Neck Pain Task Force (for the common causes of neck pain) are offered at Omagh Chiropractic. These include manipulation (chiropractic adjustments), mobilization, manual therapy and education. Treatments that are unlikely to help the most common causes of neck pain include cervical collars, passive modalities (TENS, ultrasound, electric muscle stimulation), injections (like corticosteroid injection in the cervical facet joints), radiofrequency neurotomies (heating of nerves in the neck to decrease pain) and surgery Omagh Chiropractic offers evidence Informed non-invasive alternatives that may provide you with relief. Is Chiropractic Safe and Effective ? Time and again, chiropractic is shown to be a useful, safe and preferred method for neck pain without all those drugs, injections or surgery. At Omagh Chiropractic, spinal manipulation (chiropractic/adjustments) is combined with additional types of manual (hands-on) therapy like trigger point work and myofascial therapy, and therapeutic exercise in order to provide you with the fastest results. Unlike most other methods for neck pain (injections, medication, surgery), chiropractic is generally not associated with serious side effects. The most common side effect is a temporary increase in spinal pain. Most often, after the initial increase in discomfort is preceded with relief and increased range of motion. The Chiropractor at this Omagh Chiropractic practice is highly trained and skilled in the art and science of chiropractic adjustments. 1. Haldeman S, Carroll L, Cassidy D, Schubert J, Nygren A. The bone and joint decade 2000-2010 task force on neck pain and its associated disorders: executive summary. Spine. 15Feb 2008; 33(4S): S5-S7. 2. Korthals-de Bos et al (2003), British Medical Journal.